The Archdiocese of Los Angeles agreed Saturday to a $660-million settlement with 508 people who have accused priests of sexual abuse, by far the biggest payout in the child molestation scandal that has rocked the Roman Catholic Church nationwide. "Some of the victims have waited more than five decades for a chance at reconciliation and resolution," said Raymond Boucher, the main attorney for the plaintiffs. "This is a down payment on that debt long overdue." The agreement will end all of the pending abuse litigation against the most populous archdiocese in the U.S.
"It's been a long, hard slog," said church attorney J. Michael Hennigan. "I'm delighted to see it's come to a conclusion." Lawyers had been slated to go to court Monday for the first of 15 scheduled civil trials pitting alleged victims against the archdiocese and individual priests. Settling before the legal marathon was considered particularly urgent because the archdiocese faced potential punitive damages, as well as the prospect of Cardinal Roger M. Mahony having to testify. Mary Grant and Esther Miller, both victims of sexual abuse by priests, speak in front of Our Lady of Angels Cathedral in downtown Los Angeles about reports of a settlement from the Catholic Church. 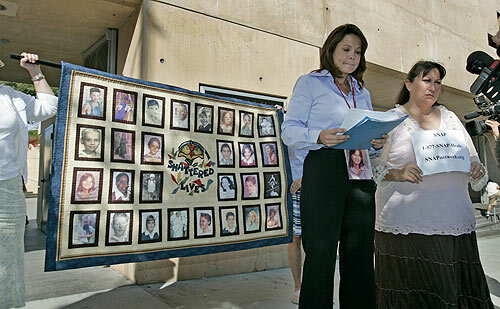 Supporters and other victims hold a cloth with photographs of other Los Angeles area victims. Although the settlement will effectively end a chapter in the sad saga of clerical abuse that has spanned decades, the resolution will come at a huge cost to the church. More than $114 million has been promised in previous settlements, bringing the total liability for clergy misconduct in the Los Angeles Archdiocese to more than $774 million. The figure dwarfs the next largest settlements in the U.S., including those reached in Boston, at $157 million, and in Portland, Ore., at $129 million. Hennigan said the archdiocese expected to pay $250 million in cash, with the balance coming from insurers and religious orders. "Parish assets will not be touched, and the mission of the church will be impacted but not crippled," he said. Mahony had previously fought victims, their attorneys and prosecutors demanding confidential personnel files that tracked the problems of accused priests and the church hierarchy's reaction to them. As part of the settlement, the archdiocese agreed it will no longer contest the release of files to the public, one of the attorneys in the lawsuits said. A private judge will mediate any objections from individual priests. Some abuse victims expressed mixed feelings about the settlement, which will give the priests' accusers an average of about $1.3 million each. The agreement will spare plaintiffs the need to testify in court, but at an advocacy group's news conference outside the Cathedral of Our Lady of the Angels downtown, Mary Ferrell, 59, said it nevertheless stirred up old pain. "That amount of money is impressive in that it shows tremendous guilt," she said. "But I didn't file [the suit] for the money…. I would give back the money if I could have my childhood back." The settlement was welcomed by some national observers. "The diocese has finally conceded the fact that everyone needs to move on," said Anne Burke, an Illinois Supreme Court justice and former chairwoman of the National Review Board, a panel of lay Catholics formed by U.S. bishops in 2002 in response to the scandal. 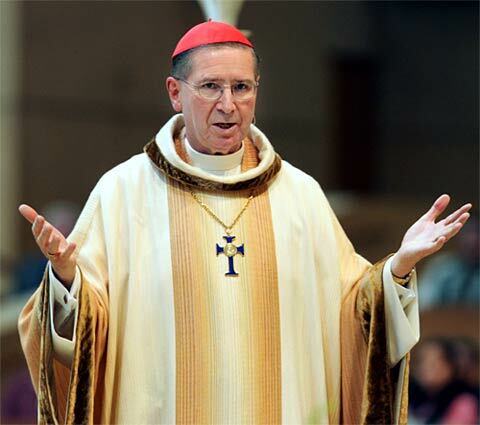 Burke said negotiations for the Los Angeles settlement were undoubtedly more complex than many in other dioceses, "but I also think it was prolonged longer than it should have been because the diocese proceeded to fight. Consequently, it's been a long, long time … and it prolonged the agony of it all." The settlement will resolve the last of about 570 total claims of abuse against 221 priests, brothers, lay teachers and other church employees spanning the last 70 years. The pact will be presented for final approval Monday to L.A. County Superior Court Judge Haley Fromholz, who had been scheduled to try the first case. With so many plaintiffs, so much money at stake and the archdiocese frequently at odds with its insurers, negotiations were especially tense over the last few days. Cardinal Roger Mahony celebrates Mass at the Cathedral of Our Lady of the Angels in this May 2006 file photo. Lawyers for the L.A. Archdiocese and alleged clergy abuse victims are closing in on a deal that could top $650 million. Two major insurance carriers would not stipulate to pay anything until Friday afternoon, when they suddenly agreed to the offer on the table, according to one attorney, who asked not to be named because he was speaking before the settlement was announced. After the Associated Press first reported Saturday morning that a settlement had been reached, the Survivors Network of Those Abused by Priests scheduled a news conference, canceled it and then scheduled another. A church representative at one point confirmed a settlement, only to call back minutes later to say it was off. The accusations of molestations in the archdiocese were part of a national scandal that had been simmering for decades. However, it wasn't until 2000 that the silent epidemic of priestly abuse exploded into public view. In Boston, Cardinal Bernard F. Law was swamped by media revelations that he routinely covered up allegations of abuse involving scores of priests, shuffling some of them from one parish to the next without penalty to the priests or notice to their new flocks. On Dec. 13, 2002, the cardinal resigned, asking forgiveness of "all those who have suffered from my shortcomings and mistakes." In California, the Legislature responded to the national outcry by suspending a statute of limitations for one year, allowing childhood sexual-abuse lawsuits to be filed in 2003 regardless of when the incidents allegedly occurred. By year's end, the Archdiocese of Los Angeles had been hit with more than 500 suits. "If Boston was the beginning and the cornerstone of the scandal, California is going to be the capstone of the crisis," predicted Richard Sipe, a former Benedictine monk and a consultant to plaintiffs' attorneys. Thousands of emboldened victims stepped forward across the U.S., creating repercussions that have shaken almost every parish. Facing huge payments to settle abuse litigation, five dioceses, including San Diego's, have filed for bankruptcy protection. At least 10 bishops and archbishops have resigned over their alleged involvement in sexual abuse or in covering up the abuse of others. Parishes have been terminated, schools shuttered and ministerial programs shut down. In Orange County, the Diocese of Orange two years ago paid out $100 million to 90 alleged victims who had filed lawsuits. As part of the settlement, the diocese released thousands of documents indicating a high-level cover-up of priest abuses. In San Diego, a bankruptcy judge has set an Aug. 13 deadline for a settlement between sexual-abuse claimants and the diocese. If the two sides cannot reach one, they face an Aug. 23 hearing that may result in the lawsuits going to trial. In Los Angeles, some 75% of the archdiocese's 288 parishes were served at some time by a cleric accused of molesting, according to a Times study. As the scandal's details slowly emerged, it became clear that the church hierarchy knew about complaints against some priests and that at least a dozen were allowed to continue working in ministry after their conduct with children was questioned. The archdiocese has issued a stream of mea culpas, acknowledging its responsibility for shielding some of the alleged abusers. At the same time, Mahony strenuously opposed giving prosecutors and plaintiffs' attorneys confidential personnel files that would detail accusations against priests and any actions taken — or not taken — by him and others in the hierarchy. In February 2004, a lay panel convened by the U.S. bishops' organization ripped into Mahony for his intransigence, saying his refusal to turn over documents "did little to enhance the reputation of the church in the U.S. for transparency and cooperation." The archdiocese said its resistance was a matter of principle. To disclose "the spiritual, pastoral and psychological counseling of the priests" would be to breach a sacred trust, the archdiocese contended in a 2004 report. The archdiocese says it now takes all abuse allegations seriously, admitting that in the past a firm denial from an accused priest often used to end the matter. When complaints are made today, church officials say, they immediately notify police, pay for counseling for the victims and, if the complaint is deemed credible, remove the priest from active ministry. Although Mahony has removed at least 17 priests from ministry over accusations of sexual abuse, his credibility has been called into question by cases like that of defrocked priest Michael Stephen Baker. In 1986, Baker told Mahony that he had abused two or three boys several years before. Instead of calling police, Mahony sent the priest to New Mexico for treatment and over the years transferred him to nine different parishes, where he allegedly molested 23 boys and girls. Baker faces 15 criminal charges. Mahony has acknowledged making serious errors in the case, calling it the one that troubles him the most. The lawsuit that was to be heard Monday involved accusations against Father Clinton Hagenbach, a priest who died in 1987. He has been accused of molesting 18 boys from 1968 to 1986. The archdiocese settled one man's claim against him in 2002 for $1.5 million. Outside the cathedral Saturday, Ferrell, a retired nurse, said she was 7 years old when Monsignor George Scott started abusing her. She said whatever money she gets from the settlement won't repay her for the hard times of her life, which included alcohol and drugs and her current bout with Parkinson's disease. But it will make her more comfortable and provide an inheritance for her three children and six grandchildren. "This was 50 years ago," she said. "But it didn't end 50 years ago."